A good pair of waterproof boots can only do so much against the strongest of elements. Water, snow, and small debris can make their way into boots, especially a well-worn pair. That’s where gaiters come in, removable protection that can be added around a boot and upper shin area to add an extra layer of waterproof and debris protection. This ensures that not only do your feet remain dry and protected, but your pants as well. What are Gaiters? What is a Neck Gaiter? Gaiters are a covering of leather or cloth that are made to wear over a shoe or boot, protecting the footwear along with the lower leg. Gaiters are great for protecting the bottom part of pants from rain and even snow. Neck gaiters are tubular scarves and are made to protect your neck from any cold chills that may try and creep up. They can also be pulled over your mouth, nose, ears, and lower half of your face if needed, due to their stretchy nature. They can be made of spandex, polyester, and fleece, and they keep your neck and face warm without being too claustrophobic. For protecting your footwear and other parts of your body, a gaiter should be made of the best quality material that is strong enough to hold up against the worst elements. The best of these products are produced with materials such as leather or polyester (a somewhat plasticized synthetic material) that are both durable and waterproof, an efficient protector from rain, ice, and snow. As long as the waterproof factor of a gaiter isn’t compromised, breathability can be something that you should look for when searching for the best gaiter. Your body naturally lets out heat and moisture, making it important for a gaiter to balance releasing body heat and excess moisture with offering protection from the elements. Finding a gaiter that is the perfect fit is important; you don’t want something that is too tight or too loose. If it is too tight, you won’t have any proper breathability, and it won’t fit as comfortably as a properly fitting gaiter would. If it’s too loose, the gaiter won’t provide proper waterproof protection, making water and snow more likely to leak in. Finding the best hunting gaiter can be difficult, especially with all the different options on the market today. Luckily for you, we’ve compiled a list of the best hunting gaiters that you should consider purchasing, from leg to boot gaiters, plus a neck gaiter as well. With these options, you’ll be well prepared for your next hunting trip, should it rain or snow. These gaiters are abrasion-resistant, waterproof, windproof, breathable, and feature a laminated construction that ensures proper protection. A larger circumference can accommodate for even plastic boots, so you won’t have to worry about an ill-fitting gaiter. A durable and lightweight Bio Thane instep strap helps keep the gaiter secure to the boot for a proper fit. 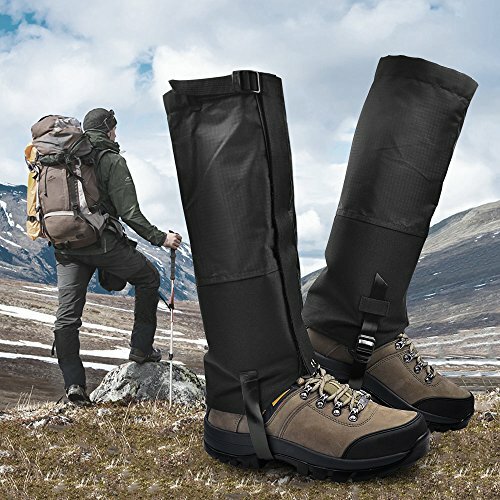 A pair of these gaiters will ensure that your boots stay free of debris, your feet remain dry in streams, your pants remain rip-free, and so on. With a durable material that prevents abrasion while still being breathable, these gaiters also help regulate heat, making sure your feet stay warm without causing humidity to develop. These gaiters are durable, abrasion-resistant, waterproof, and more. They protect your shoes and feet from persistent chills, water, ice, snow, and debris. Breathability ensures that your shoes don’t become humid, allowing natural body heat and moisture to properly regulate out. One thing to consider is that these gaiters do tend to run large, and there is no elastic on the bottom edge, so a perfect fit may take a few pairs to find. Able to withstand long hunting trips over rough terrain and through harsh weather conditions, this is the perfect pair of gaiters to add to your must-have hunting gear. This pair of leg gaiters are waterproof thanks to their 600D oxford fabric and 300D polyester material, not only providing top notch waterproof capabilities but also resistance to tears and punctures. The top features an adjustable buckle strap that allows you to secure the gaiters in place and have a comfortable fit, while the TPU foot band on the bottom ensures security. 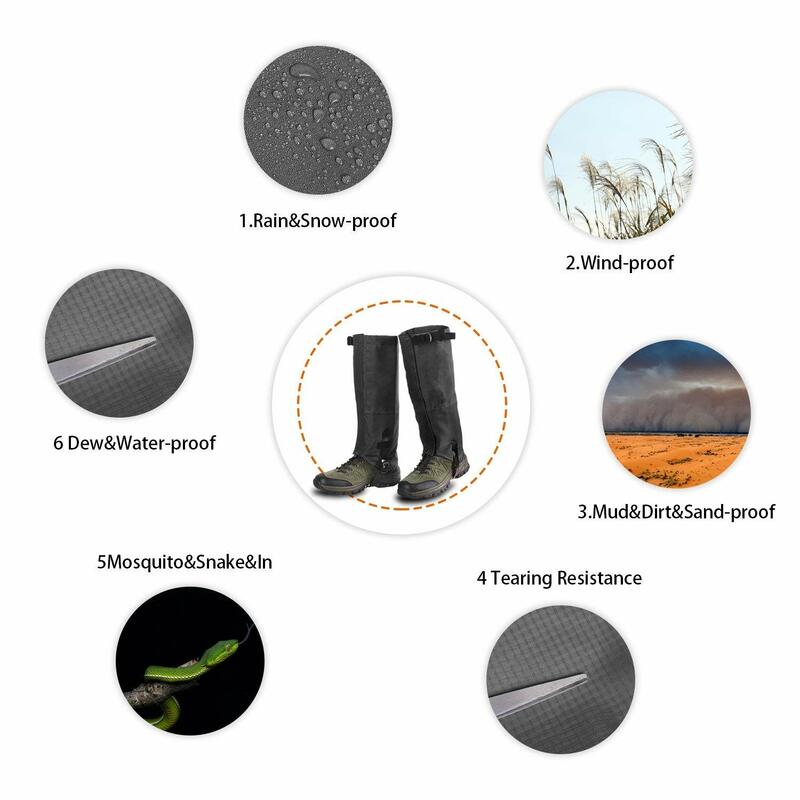 The water and dust proof material that these are made of works to prevent water, mud, rain, snow, insects, sand, and more from entering your shoes or pants. 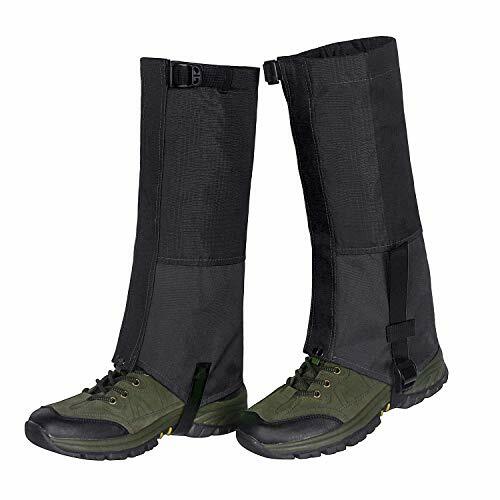 Wide opening velcro allows for easy attachment and removal, and it allows these gaiters to fit many boots of different sizes. They are lightweight and can be folded to making carrying them around by hand or in a bag easier. They also come in various sizes and colors, including blue, green, and black. Overall, this is a sturdy pair of gaiters that are worth investing in. For a good price, you get gaiters that are waterproof, as well as tear and puncture resistant. They hold up against wind, rain, snow, debris, etc. The straps are adjustable, allowing you to achieve the perfect fit for a variety of boot or shoe sizes. The strap that goes under the heel is a bit short and will need some adjustments. The straps on the top and bottom of the gaiters loosen occasionally, so minor adjustments may be made during their wear time. Having a good amount of length to them, you can walk in deep snow or through streams, while your feet and footwear remain dry. Made of nylon, these gaiters are the best boot gaiters for hunting. A Hypalon instep strap ensures security, and the one-inch wide hook and loop front closure allows for a proper and comfortable fit. There is also a bottom shear tab that secures the front closure, and the addition of a reinforced boot lace hook makes for the perfect fit. Breathable material ensures that excess body heat and moisture are able to escape the gaiter, so you won’t have a build-up of heat or sweat while these are being worn. 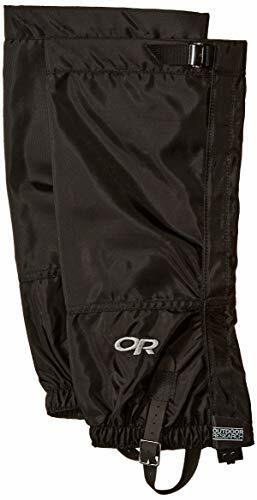 These gaiters are not waterproof, as nylon is a material that can absorb water rather than repel it, so it would be best not to wear these on a rainy day. They do provide protection from debris and natural materials such as rocks, sticks, and twigs. These gaiters are made of durable nylon and can stand up against debris and other natural materials that may be experienced in a hike or hunting trip. The material is not waterproof, so be wary if you wear them in the rain. A Hypalon instep strap and reinforced hook and loop closure ensure a secure and comfortable fit for your footwear. The breathable material makes these gaiters perfect to wear during warmer weather, effectively regulating body heat and excess moisture so sweat won't build up. The sizing for these gaiters can be a bit confusing, so be sure to measure your calf and check the sizing chart based on that. You may also be able to purchase more than one pair and return the pair that doesn’t properly fit, just in case you’re worried about the sizing. 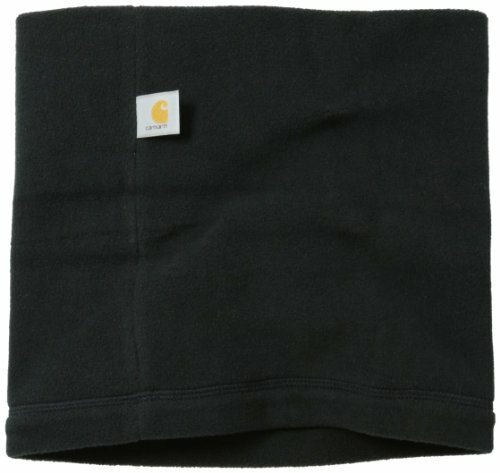 This neck gaiter is made of polyester and spandex, with fleece to help ensure your neck stays warm. Comfortable and easy to use, this is the perfect addition to your next hunting trip, should the weather lead to wind and cold temperatures. The material is very durable and able to stretch, and the gaiter is long enough so you can pull it up and cover the lower half of your face. It is better than your typical scarf, able to help keep in heat while still being breathable, and it’s small enough to fit in a pocket, so you can carry it around whenever you think you’ll need it. Once you find one that is the perfect fit, not too loose or tight, you’ll never want to go on a hunting or hiking trip without it. This neck gaiter is durable and comfortable, made of polyester and spandex with fleece to keep your neck and face warm and protected from chills. The material makes it so that the gaiter can be stretched over the lower half of your face, keeping your mouth, nose, and even ears warm. One downside to this product is that the tag that provides cleaning instructions is located on the inside of the gaiter, making it a bit irritating on the skin. You could cut it off and make sure to remove it all, or you could turn it inside out if needed. Finding the proper size is also important, as one too small would be uncomfortably tight, and one too loose would constantly fall down. For a quality neck gaiter at such an impressive price, there is no loss from purchasing this item and adding it to your favorite outdoor accessories. 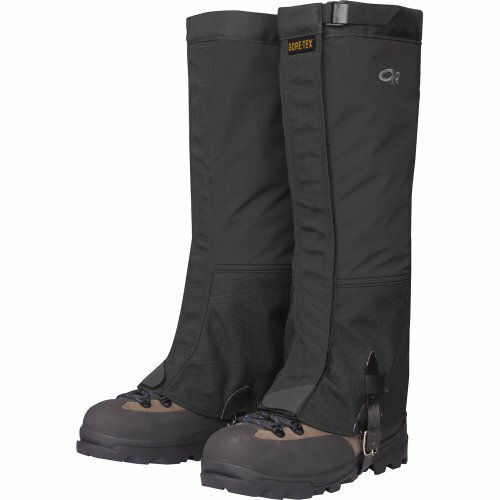 These gaiters are the best to use for snow trips or anywhere you may experience wet conditions. The waterproof nylon fabric is also breathable, providing protection from dust, debris, rain, snow, insects, etc. A wide front opening with velcro closure allows for easy to put on or remove, while a durable TPU belt creates a more secure fit, and is able to last through extended wear and tear. These gaiters are lightweight and can fold up nicely, making them great to carry around for any trip outdoors, should you need an extra layer of waterproof protection. They can withstand low temperatures, and also warmer conditions if necessary, thanks to the breathability of the material. Colors that this item comes in includes black, blue, gray, and green, and they are able to fit a variety of boot sizes. Overall, this is a great pair of waterproof gaiters, and they come at an impressively low price. You can choose a color that best suits your style, and the sizes can fit multiple sizes of boots. Waterproof nylon fabric is durable, tear and puncture proof, and also breathable, making it perfect for various weather conditions. Breathability allows for excess body heat and moisture to regulate out, so it will remain comfortable while being worn. One thing to keep in mind is that they can be a little difficult to put on until you break them in more, and the TPU belt doesn’t always stay securely tightened. Other than that, these gaiters have more positives than negatives, and the price makes up for any small negative. High gaiters are typically tall enough to reach above your shin, and sometimes even all the way up to your knee. They are designed to be worn over boots and are great for traveling off-trail with or through streams (provided that the gaiters are waterproof). They are capable of protecting your shoes and pants through snow, rain, debris, etc. Low gaiters are great for protecting against mud, debris, sand, etc. They are shorter than high gaiters, usually around ankle height, and they are under a foot tall. They are made of a breathable and lightweight material and can keep out debris you may experience from trails without inhibiting movement. With low gaiters, you have more range of movement due to their shorter design. Neck gaiters are used to protect your neck and lower face. They can often be pulled up and over the lower half of our face to protect your mouth, nose, and even ears from unwanted chills. The material usually involves polyester, a little spandex, and fleece to keep it durable and warm. They often remain breathable, so you won’t feel constricted. Gaiters are great for protecting your footwear and pants from rain, debris, snow, mud, dense shrubs, bushes, and so on. They are made from durable materials that are often quite puncture and tear proof, and waterproof as well. Gaiters are perfect for adding an extra, waterproof layer of protection to your feet, able to keep them insulated while still being breathable, perfect for those cold winter months. With many different types of gaiters out there, all at great prices and of good quality, you’ll be doing yourself a favor to purchase one and add it to your inventory for your next hunting or hiking trip. What’s the Best Material For Gaiters? The best material for gaiters would be nylon or polyester oxford fabric. Oxford fabric used for gaiters is often finished with a water repellent and laminated with a polyurethane coating. The material remains pliable and stretchy while adding durability and waterproof capabilities. Nylon is also great because it is comfortable, elastic, and durable. Neck gaiters aren’t difficult to wear, and they’re quite comfortable if you find the right fit. Neck gaiters are similar to tubular scarves and can be placed over your head and then pulled down to protect your neck from the wind. They typically contain enough extra fabric to be pulled up to cover the lower half of your face, including your mouth, nose, and ears. Because of its tubular design, gaiters stay securely in place, as long as you’re not wearing one that is a size too big. You can also wear them as a ski cap to protect your ears and face, or as a bandana. How Can I Keep My Gaiters Waterproof? Even if a gaiter is said to be waterproof, it doesn’t always keep the rain or mud completely out. You can keep your gaiters waterproof by adding a polyurethane spray to it, as it is a reliable sealer and is capable of protecting any fabric that is not typically waterproof or water resistant.